Encaustics. The word isn’t as unfriendly as it sounds—in the art world, at least. Suggesting some kind of sarcastic wit or angry aesthetic, it’s actually a term for a technique of art that does require a thick skin, in a way—for the works of art themselves. Encaustic painting is a process which involves heating beeswax to a molten state, then adding pigment and damar resin. The resulting paint is then applied to a surface (wood, canvas, etc.) in layers which are fused together with a heat gun or torch. The process of applying many layers of translucent wax gives encaustic paintings amazing depth and luminosity. The practice predates oil painting and, not surprisingly, due to its preservative qualities, dates back to ancient Egypt. This show—only the third at the recently opened Meyer Gallery just off 400 South— showcases the work of three of the leading encaustic artists in the country: Californian Chris Reilly and his wife Michelle Haglund, and Montana-based Will Pope. 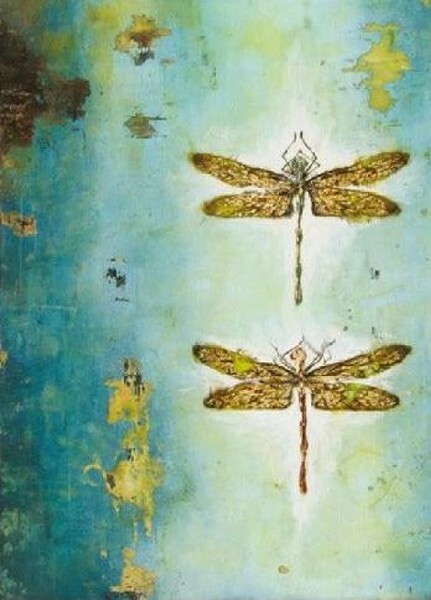 Reilly’s dragonflies (detail of “Twin” is pictured”) look like the product of some aesthetically charmed entomologist. Haglund adds an almost-Japanese style to birds rendered in the medium, and Pope takes an unlikely turn to pop art with his works. It’s much more versatile and available to be worked with than one might think, as layers can be scraped away to reveal textures underneath, and even collage elements can be combined to create a work with wit and verve. Encaustic painting and sculpture @ Meyer Gallery, 350 S. 200 East, No. 100, 801-363- 0993, through May 15.